Probably because I'm a visually oriented person with a long standing love of medieval art and the inherent symbolism it's laden with, I've always wanted some sort of symbol to wear that represents what I believe. Sadly, most of the choices seem hokey, or not quite on the mark. There's the red "A" of Atheism, which is combative and says more about what I don't believe, so that's not quite right. There's the anthropomorphized "H" of humanism, but that doesn't entirely suit me either. Today, while looking at the Coalition for Reason website, I was suddenly struck by that one word, "Reason." The etymology of that word traces it's meaning back to the Greek word "Logos" or λόγος if you prefer. "Ah-Ha!" 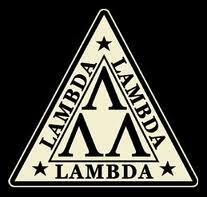 I thought, I could simply use the Greek letter Lambda, Λ, as a symbol! Which is really a convoluted way of confirming what everyone already knew: I'm a nerd.